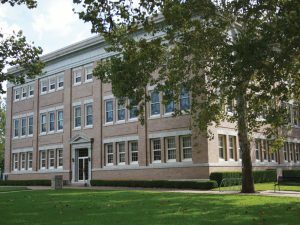 If those walls could talk … Sherman Hall could certainly tell many tales; the classical revival-style building has played a very important role in the life of Austin College—for nearly 100 years. The building, dedicated on April 8, 1915, has served as home to the College library, administrative offices, and chapel; housed decades of faculty; heard the recitations and conversations of hundreds of students; and welcomed a multitude of speakers and special programs in its original two-story auditorium, which included a top quality pipe organ. Those speakers have included famous guests from magician Harry Houdini to former President William Howard Taft to former President George H.W. Bush and a host of others between and since. Today, the three-story building serves as the home to Humanities faculty and classrooms for history, religious studies, English, and philosophy—plus more speakers, performers, and guests. 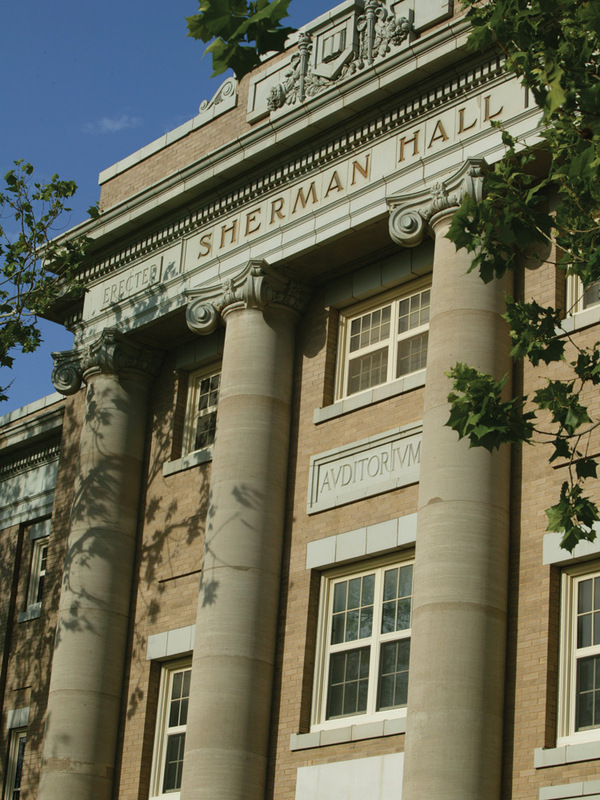 Sherman Hall was built at a critical point in Austin College’s history. Today, the story of the homesick young student who set fire to “Old Main” (and a week later, another building) hoping classes would be cancelled so that he could go home, seems almost comical. 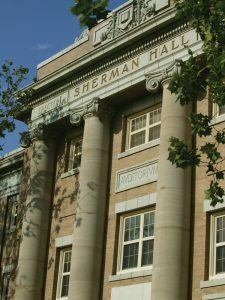 In 1913, however, the incident could have been devastating for the College and brought questions of whether the College would remain in Sherman, as North Texas cities offered the College other options. Old Main had provided all classrooms and labs, faculty and administrative offices, the chapel, the library, and meeting rooms for the campus. Fortunately, the fire galvanized the determination and loyalty of students and faculty—and Sherman business leaders who wanted to retain the College, which had moved to Sherman in 1876. President Thomas Stone Clyce and the Board of Trustees launched a building campaign to replace Main Building and construct four needed buildings. 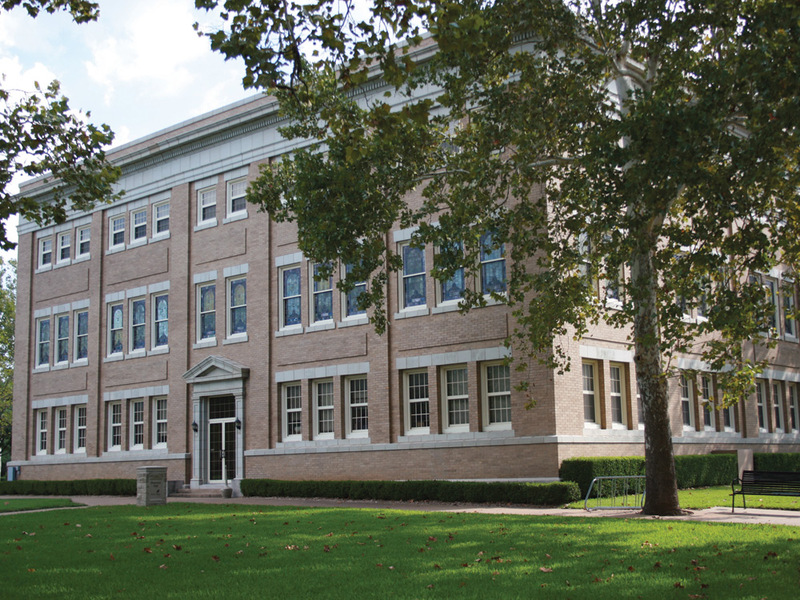 When plans began for a building that would be located on the eastern edge of campus along Grand Avenue, the citizens of Sherman rallied to the cause, according to Light Cummins’ Austin College: A Sesquicentennial History. 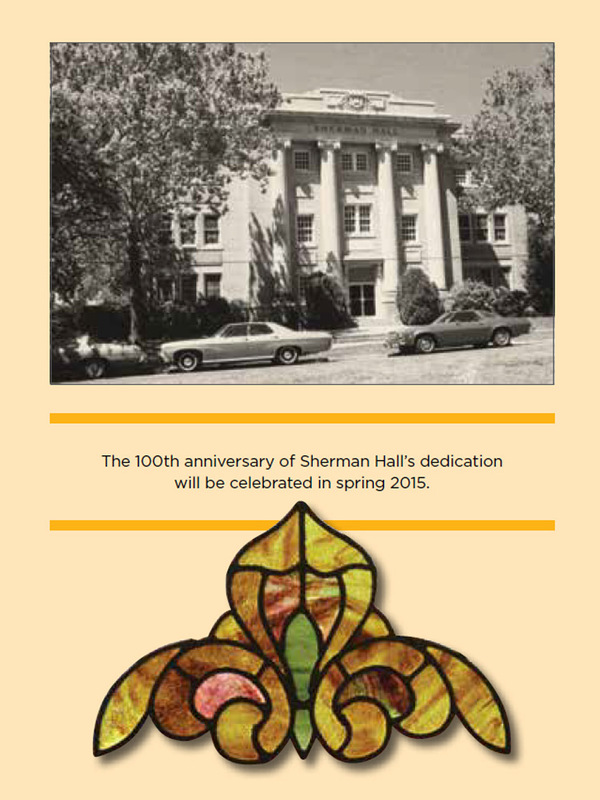 When local pledges reached $50,000, College trustees named the building Sherman Hall to honor the support of the citizens of Sherman. The building was completed within a year and formally dedicated in spring 1915. In a 1960 renovation of the building, central heat and air were added, the balcony of the auditorium was closed in and converted to third-floor offices, and the organ was removed. Also at that time, the naming of Hoxie Thompson Auditorium was announced to honor the graduate and trustee. In 1989, a top-to-bottom renovation completely replaced the interior of the building, including wiring, plumbing, and an energy-efficient temperature control system. Then, and still today, the exterior remains much the same as it was 100 years ago at its dedication. Beautiful stained glass windows that were part of the initial construction and bear the names of early Board of Trustees members remain, though many have been refurbished and restored, and offer a continuity of history.